The gargantuan beat maker is like a strange hybrid of a midi-controller and one of those dance mat games you find in arcades. 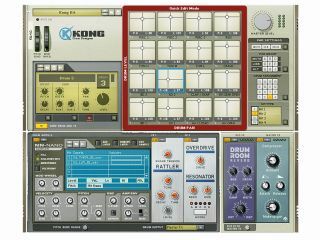 From what we can tell, it appears to utilise Propellerhead's Kong Drum Designer, one of the highlights of the company's new Reason 5 DAW. Check the video above to see the machine being made, and released on Stockholm's general public. Needless to say it's all very cool. Meanwhile, Propellerhead's Reason 5 and Record 1.5 are both released tomorrow (25th August) and we've got all the info here.